BizReport : Research Library : Virtela Communications, Inc.
BACK TO VIRTELA COMMUNICATIONS, INC. 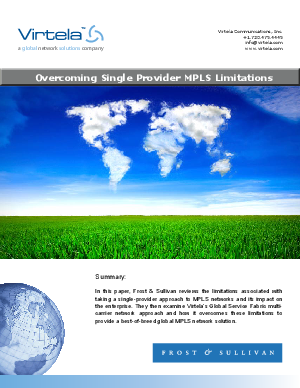 In this paper, Frost & Sullivan reviews the limitations associated with taking a single-provider approach to MPLS networks and contrasts them to the benefits of a global multi-carrier MPLS network. They examine Virtela's Global Service Fabric (GSF) which melds MPLS technology and service delivery to reliably deliver the full benefits of performance routing MPLS technology with the comprehensive geographic reach and route diversity of multiple MPLS providers. Virtela's GSF multi-carrier network approach overcomes mapping CoS across dispersed networks to provide a best-of-breed global MPLS network solution.